In 1901 Federation transformed Western Australia from an independent colony to a state of the Commonwealth of Australia, and Perth gained the status of capital city. Originally funded by agriculture, the discovery of gold gave it the finances to transform itself from a modest country town to a prosperous commercial city with great civic buildings to match. From its settlement in 1829, Perth gradually took shape as a modest town. In the early years its development suffered from a severe shortage of investment and labour to build anything above modest buildings. Change came slowly, and each round of building was, in general, an improvement on existing living conditions. As the economic situation improved, the early, almost temporary, structures gave way to larger and better buildings. The first gold boom of the 1890s gave Perth the financial impetus to transform the city from a sleepy country town into an elegant and stylish city, with successive mineral booms thereafter contributing to an attitude of 'out with the old and in with the new'. 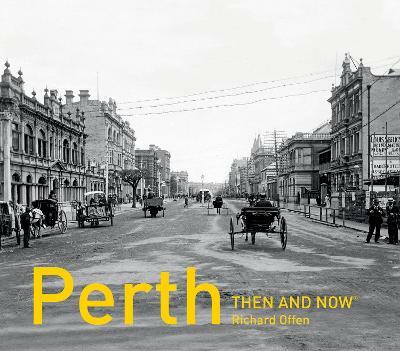 Taking the losses in chronological order, Richard Offen (author of the best-selling Perth Then and Now) catalogues the beloved buildings and Perth institutions that time and progress have swept aside. Lost Perth includes: Josie's Cottage, First Government House, Padbury Building, Boans Department Store, Ambassadors Cinema, Mitchell Building, trams, market gardens, Esplanade Hotel, Emu Brewery, Dalkeith Hot Pool, the Christian Brothers School and Perth Flower Day. Buy Lost Perth by Richard Offen from Australia's Online Independent Bookstore, Boomerang Books. Richard Offen is the executive director at Heritage Perth, which has become a significant force in the promotion of the history of Perth. He takes walking tours of the city's historic sites and is a popular lecturer on the subject. Richard is a regular broadcaster on both radio and television, with a weekly spot on ABC Perth's Breakfast Show. He is the co-author of The Living Coast.